With the help of an absorption Hydrogen cell, SWAN can also provide a measurement of the radial velocity of H atoms with respect to SOHO. This image can therefore be interpreted as a "Dopplergramme" of the H Lyman-alpha interplanetary emission. The radial velocity is zero where the effect of the absorption cell is maximum (minimum value of the Reduction factor which is the ratio of the Lyman-alpha intensity when the H cell is ON to the intensity when the H cell is OFF). The color code indicates radial velocities. 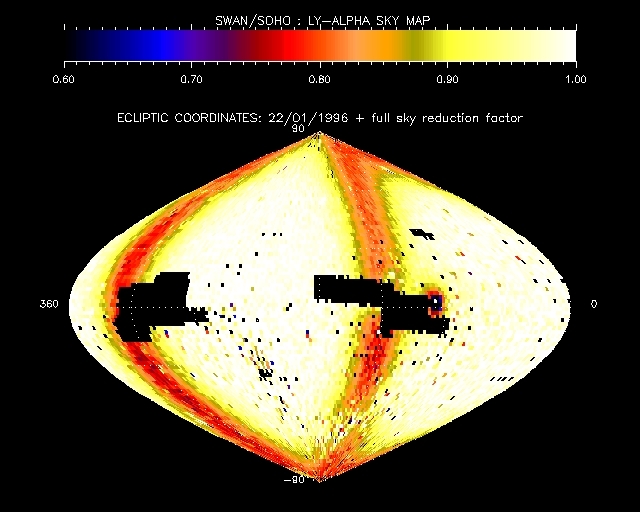 It can be noted that the Ly-alpha emission of the Geocorona is also strongly absorbed.